Vitamin D. You probably know you get it from exposure to the sun’s rays, and you might have felt like you’re low on it during the winter months in our chilly climate. What you may not realize, however, is that Vitamin D doesn’t just help your body absorb calcium – it’s used by muscles for movement, your nerves to carry messages between the brain and body and your immune system to fight off sickness. 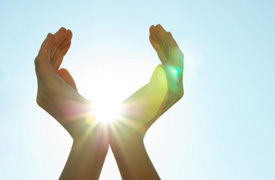 An essential aspect to consider of Vitamin D intake is that your body must be able to use what you give it. If your nervous system isn’t functioning properly, your brain and body can’t coordinate as they should. At Advantage Chiropractic, we focus on your neurological health, ensuring your body can use the vitamins you put into it, including Vitamin D.
In the colder months, it’s tougher to get Vitamin D from the sun, and you may need to take a supplement. You may have heard of Seasonal Affective Disorder, which is common in the fall and winter months. It makes you feel moody and exhausted, setting in and ending around the same time each year. Taking a Vitamin D supplement can be the key in fighting off this form of depression. During the winter, it feels like the snow and frost will never end, and you can’t wait for those first warm days. Remember, though that the sun’s UV rays are strongest between 10:00 a.m. and 4:00 p.m. It’s wise to limit your direct exposure to the sun by sitting in the shade, wearing a large hat and remembering your sunscreen. By starting to take Vitamin D now or by safely exposing yourself to sunlight, it makes Vitamin D easier for your body to absorb in the winter – during the months when you’ll likely need to take a supplement to get your daily recommendation. The more of any nutrient you give your body, the easier it becomes to have your body use it as needed. If you have any further questions about Vitamin D and other supplements, Dr. Evan at Advantage Chiropractic is pleased to provide recommendations. Contact us today!